Finally, the worst of the Blizzard of 2016 appears to be over for air travelers. Airlines had canceled more than 13,400 flights since the storm began Friday. 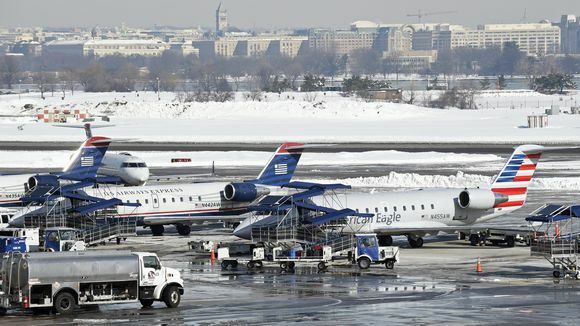 But Tuesday’s schedule indicated that cancellations had leveled off, allowing airlines to turn their focus to resuming normal operations and clearing the backlog of fliers stranded by storm-related cancellations. About 670 flights had been canceled nationwide as of 9:10 a.m. ET, according to flight-tracking service FlightAware. That number was down significantly from the 1,658 cancellations reported Monday and down even more from the 3,526 cancellations on Sunday. Saturday was the worst day for fliers, with more than 4,500 cancellations across the nation. But Tuesday looked like a better day for air travel. Most of Tuesday’s cancellations were preemptively announced by early Sunday, and the tally has not grown much since then. All airlines with operations in the storm’s path have been canceling flights and offering ticketed fliers refunds or waiving change fees that allow them to fly another day. The waiver policies vary by airline, but they generally allow customers to make one change to their itineraries — with some restrictions — at no additional cost. To read more and access links to each airline’s cancellation policy page at USA Today, click here.